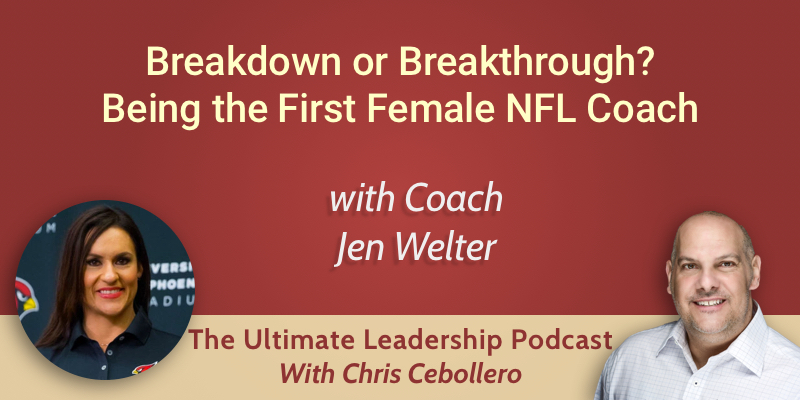 On today’s podcast, we are joined by Jen Welter the first woman to coach in the NFL. She set the example for others to follow, as being the first meant she had no one to aspire to. Jen tells us about women playing football, and how they do it for the love of the game. The first cheque she ever got for being a professional football player was when they won the Superbowl, and that cheque was for $12. Her experiences translate into the game of life. If you have a passion, you shouldn’t see any door as being closed because of a perceived difference such as gender. Every opportunity she’s had to step up has been driven by those women in her team who inspire her and give fuel for her fire every day. Could you walk a mile in these shoes? Jen wanted to take her practical experience of playing football and use her psychology background to provide a unique perspective to help athletes on their journey to greatness. She says the NFL was larger than life and she never imagined she would coach, as she had no women to look up to so didn’t see it as a possibility. She ended up coaching after playing men’s football for a season, which taught her to be a great teammate when she wasn’t a star as she was on the practice squad. Jen caught the attention of a coach when he was impressed by the dynamic of how close she and her team were, and he offered her a position as a coach. Initially, Jen said no. She wasn’t prepared. But, he wouldn’t let her not do it so he took the job on her behalf and told her she couldn’t quit. Jen had no one to aspire to, as she was the first female coach in the NFL, and she thought it was important to show that it could work for any other women who wanted to step into that role. Brian Arians talked to players about bringing her in, and when they agreed he worked up to the top to tell them everyone was on board with having a female coach. By doing this, he put his reputation as a leader on the line, and the way he did it set the tone of it being a good thing and not a publicity stunt. When Jen joined, she didn’t force the players to listen to her as they had chosen to. They knew she had something to add, and she was brought in because everyone believed it would work. Jen has documented her journey to being the first female coach in her book Play Big: Lessons in Being Limitless from the First Woman to Coach in the NFL. Women playing football had been described as the “best-kept secret in sports”, but she didn’t want them to be a secret anymore. She saw the book as a great opportunity to tell a story, and not a football story but a life story. There are many parts in the book which could be for anybody working hard for a dream. Jen promised to stand up to any challenge presented to her throughout her career, which made her willing to make small steps forward towards bigger accomplishments. In her book, Jen wants people to find things which can be translated into their own lives. Can you have a great impact and be a good teammate, even when you’re the underdog? She hopes for people to realize there’s a point in everyone’s lives where it’s either breakdown or breakthrough. Breakthrough comes when 99.9% of people would break down, and all you need is one more ounce of faith that will pull you through to find success.